This is one of those recipes that after just one bite you know you’ll be doubling the batch the second time around! 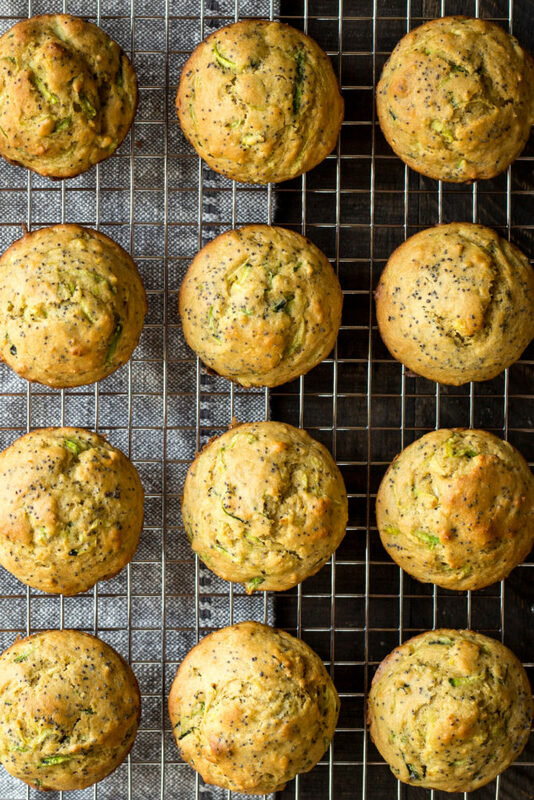 These muffins are absolutely wonderful and are another great way to use up all the zucchini overflowing the farmers market booths and CSA boxes this time of the year. They are sweetened with honey which I think compliments the tang from the lemon more so than cane sugar. The poppy seeds lend a lovely crunch and the zucchini adds a mellow sweet flavor and plenty of moisture. These taste great with your morning cup of coffee and are equally good crumbled on top of plain yogurt for a filling breakfast. Combine the flour, baking powder, salt, poppy seeds and lemon zest in a medium sized bowl. In a small combine the lemon juice, oil, honey, eggs and almond milk. Make a well in the center of the dry ingredients and add the wet ingredients. Stir until just barley combined and then gently fold in the zucchini. Spoon the batter into a greased standard size muffin tin and bake for about 20-23 minutes or until lightly golden and a tooth pick comes out clean when inserted into the center of a muffin. If I wanted to use stevia in place of honey, how might I alter the recipe?? I’ve never used stevia. I’m not sure–I’m assuming it will alter the texture a bit. I can’t guarantee the results because I’ve never tried it that way. If you do let me know how they turn out. Thanks for the recipe! They were delicious.